This print of "Three Chickadees" is a limited edition print and it comes signed, numbered, and matted to fit an 11"x14" frame. The print can be purchased through PayPal by clicking the above link or you can email me at livewiregrafx@yahoo.com and let me know you are interested in purchasing this print. Thank you! It will be a joy to have the birds in the garden again and maybe I will find some more to paint. Merci! Ce sera une joie d'avoir des oiseaux dans le jardin à nouveau et peut-être je vais trouver un peu plus à peindre. I love this! 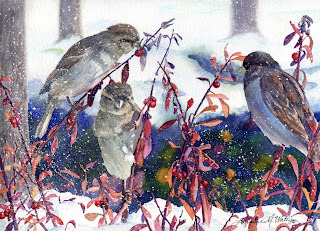 Watercolor birds are just about my favorite.Glorious and colorful Paint and nice art! !